Home » News and Views » Regal Petroleum (RPT.L) offers excellent value across all key metrics. VectorVest rates as buy with an 82p price target. 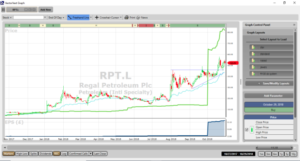 Regal Petroleum (RPT.L) offers excellent value across all key metrics. VectorVest rates as buy with an 82p price target. By Harry Dacres-Dixon in News and Views, Uncategorized on 31st October 2018 . Regal Petroleum plc (RPT.L) is an independent oil and gas exploration and production company with three gas and condensate fields in NE Ukraine. These fields comprise the Mekhediviska-Golotvschinska (MEX-GOL) and Svyrydivske (SV) fields, which are adjacent and operated and managed as one field, and the Vasyschevskoye (VAS) field. Each field is held under a 100% owned and operated production licence. 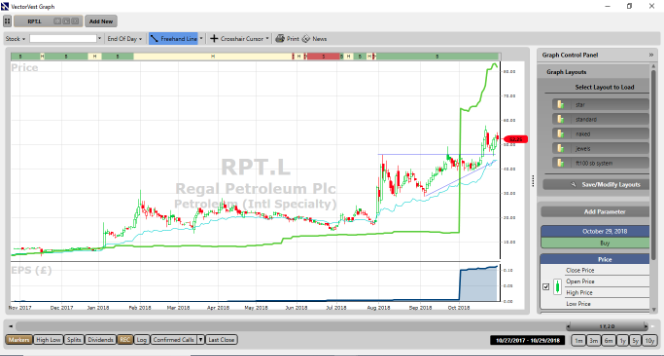 RPT is a public company, based in London, with its shares quoted on the AIM Market. RPT stock started climbing steadily toward the end of July 2018, flagging an opportunity to VectorVest members, and since that time has retained an excellent Relative Timing (RT) (stock price trend) metric of 1.73, (on a scale of 0.00 to 2.00). RPT also logs an excellent Relative Value (RV – indicator of long-term price appreciation) rating at 1.62 – again excellent on a scale of 0.0 – 2.0, and along with an excellent GRT (Earnings Growth Rate) of 39% presents a comprehensively compelling investment opportunity. Even so, trading today at 52p and with a good RS (Relative Safety) rating of 1.12 (scale of 0.00 to 2.00), RPT is still a long way below the current VectorVest valuation of 82p. The chart of RPT.L is shown above in my normal format. Recently as Earnings Per Share (EPS) increased the share was revalued (the green line study) upwards by VectorVest. Technically the share has broken out and tested a ascending triangle formation and is on a BUY recommendation on the VectorVest program. Summary: The turnaround in RPT stock since July is no less remarkable that the prior increase from year lows of 4.25p at the start of 2018. Even so, this well managed and run oil and gas company has delivered spectacular revenue and profit growth, and with a raft of excellent VectorVest metrics, also offers a decent degree of safety for the more cautious investor. Oil and gas stocks rarely go up in a straight line, but with a bullish charting configuration and good forward visibility, this is, in the view of VectorVest, one to back. Readers can examine trading opportunities on RPT and a host of other similar stocks for a single payment of £5.95. This gives access to the VectorVest Risk Free 30-day trial, where members enjoy unlimited access to VectorVest UK & U.S., plus VectorVest University for on-demand strategies and training. Link here to view.